Ala Eh!Festival Photo Contest ~ Philippine Freebies, Promos, Contests and MORE! It's definitely more fun in the Philippines! Starting today, let us promote our very own Batangas destinations through the Ala Eh! Festival 2012 Photo Contest. Show a place (natural or man-made), scenery or attraction within Batangas Province using your digicam or DSLR. Get included in the Top 30 finalists for a chance to win P30,000, P20,000, and P10,000 respectively. Each cash prize comes with a contest trophy. The Viewer's Choice will also get P5,000 while the twenty-seven (27) finalists will take home P1,000 + Certificate. Everyone within the age range is allowed to join. No entry fee required. Photo must be taken during the competition period (January 1, 2012 up to the present). Remember to set your camera's date function properly for proof of date. "Top 30 Finalists shall grant non-exclusive rights to the photos to the Batangas Provincial Government (with watermarked name credit), with the Top 3 entries being automatically owned by the latter. 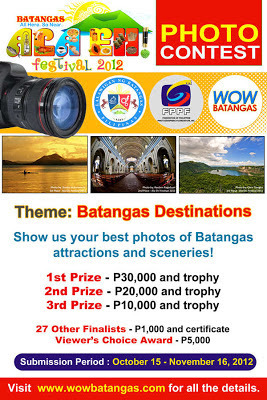 After the contest, the Batangas Provincial Government may use the entries (with watermarked name credit) for the promotion of Batangas with permission and confirmation from participating photographers."